Autumn, who is battling cancer, had never met a pig before. Since it's her favorite animal, a Virginia animal sanctuary arranged for a very special visit. 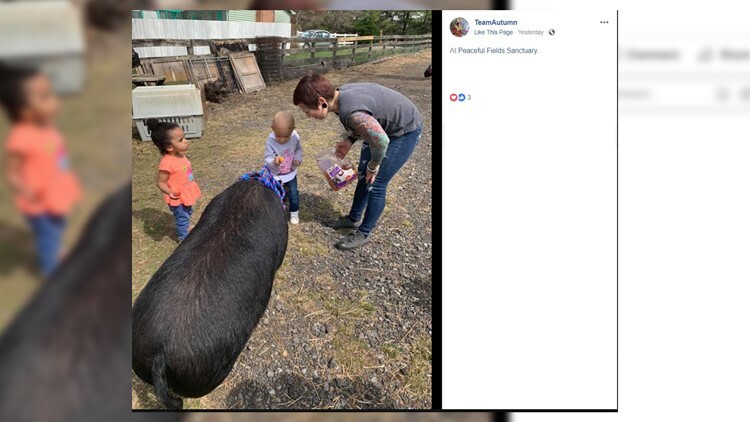 Autumn, a 2-year-old who is battling a rare form of cancer, took a special visit to an animal sanctuary to meet her favorite animal, according to Facebook posts of the visit. Autumn, from Winchester, Va., visited Peaceful Fields Sanctuary, where she met Ophelia and Ellie the pigs. She even got to feed Ophelia. Autumn meets her first pig! Autumn is being treated at Children's National Medical Center in Washington, D.C., according to her Facebook page, TeamAutumn. Her parents have set up a GoFundMe account to help pay for medical bills.